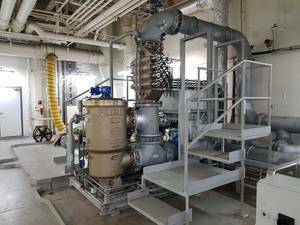 On April 16, 2019 DESMI Ocean Guard's CompactClean Ballast Water Management System (BWMS) received US Coast Guard (USCG) Type Approval. The approval is valid for all salinities and sea water temperatures, and has no requirement for a special operating mode in US Territory. Furthermore, the CompactClean BWMS has recently been approved according to ATEX and IECEx requirements for installation in hazardous zones on e.g. oil and chemical tankers, and this is also expected to be added to both IMO and USCG Type Approval certificates soon. history, and you have the explanation why CompactClean is being selected by more and more" explains Rasmus Folsø, CEO of DESMI Ocean Guard. He continues: "Some of the World's largest and leading shipowners have found the CompactClean BWMS the superior solution, and selected it for their entire fleet. We are grateful for their trust in our product and our company, and we are happy to see that as systems are installed and put into operation on more and more vessels, we receive positive feedback from involved shipowners." provides the market's most energy-efficient IMO approved BWMS. This system, called RayClean, can in some cases still be the optimal solution if available electrical power is a limiting factor and available space is less of an issue."